November 28, 2018, Dubai, U.A.E –. 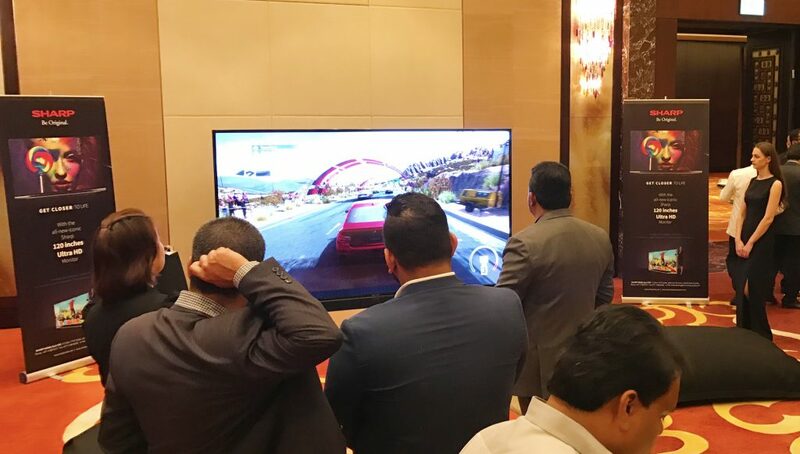 Sharp Middle East & Africa (MEA) showcased the True 8K Professional Display together with Sharp future-ready display solutions line-up during Sharp Visual Solutions Open House event. It took place at Sharp MEA’s Experience Centre, Dubai which started from 25th till 29th of November. The 5 day open house event was attended by Sharp partners from across the region. The official release and availability of Sharp’s new iconic 8K professional Display is yet to be announced. Sharp’s 8K display technology won an award during EISA 2018-2019 for” Best Product Award for Monitor Innovation”. Featuring a native 7680x4320px display (16 times the resolution of Full HD), Sharp 8K LCD monitor from panel manufacturer Sharp delivers a level of definition that has to be seen to be believed. The influential EISA AWARDS represent outstanding new products released in Europe in the past year in various expert groups, as selected by the editors and technical writers of EISA publications. This is a testament of Sharp’s dedication and commitment of innovating new technologies to contribute to the culture, benefits, and welfare of people throughout the world. Sharp Business Solutions MEA is a division of Sharp Middle East and Africa FZE that specializes in delivering innovative display solutions. The constant aim of Sharp is to provide professional displays and software solutions that increase collaboration and effective communication within the workplace, wherever that may be. We have analyzed the needs of our chosen demographic and work tirelessly to provide them with practical and innovative technologies at the very cutting-edge of science. Integrated Systems Europe (ISE) 2018, Sharp showcased nine(9) Integrated concepts; 4K Integrated Office, 8K Eco-System, Smart Signage Solutions, Sharp Campus (Education), Meeting Room Corridor, Huddle Space, Range Wall, PN-R Tower Concept and Reception & Wall Installation. The ISE 2018 event took place at the RAI Amsterdam, The Netherlands, on 6-9 February. The highlight of Sharp’s participation in ISE 2018 was the unveiling of its first 4K 70-inch Interactive Touch Board – the PN70TH5 and the its first 8K video camcorder. The demonstration of Sharp’s Integrated Office Concept linked with Sharp Multifunctional Printers (MFPs), Video Conference System, BYOD (tablet device), using two PN-70TH5, received positive comments from its visitors. The new 4K 70-inch ITB showcased its Ultra-High Definition content while offering a capacitive touch technology which recognizes 30 touch points, allowing up to four people to use a touch pen or finger simultaneously. Sharp also exhibited its new Signage Display line-up which has Built-in S.O.C (System on Chip), the PN-M series, different models of Interactive Touch Boards (80-inch, 65-inch & 60-inch) ideal for huddle space, video wall installations (PN-V701 4×4) and the PN-R Tower concept (multiple units of PN-R). The 2018 Best of ISE Awards were announced and Sharp 4K Interactive Display received the “Best New Collaboration Board” Award, and Sharp’s 8K ecosystem was also awarded the “Best Rental/Staging Product for Live Events”. 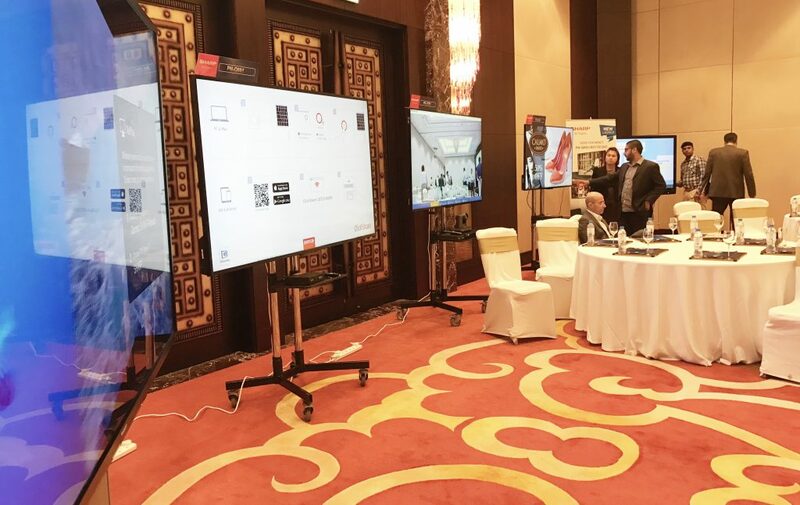 Muscat ,Oman – September, 2017 – Sharp Middle East & Africa (MEA) launched two new lineup, the PN-Q Series Professional Display and the capacitive 40-inch touch screen, PN-40TC1 which was held at Crowne Plaza, Muscat, Oman. The Professional Display launch event were held in collaboration with Sharp’s local partner Al Seeb Technical Establishment L.L.C (SARCO). The new Sharp PN-Q Series is available in 90-inch, 80-inch, 70-inch & 60-inch screen options. This new series can withstand 16/7 operation while offering FHD content quality. PN-Q Series will fit various applications in retail, hospitality, banking and other businesses that requires digital signage. Sharp’s new 40-inch intelligent touch board, PN-40TC1 offers a full-flat design with 10-point multi-touch functionality, ideal for meetings among groups of two to six people that are held in limited spaces, the so-called “huddle spaces”. The PN-40TC1 is a perfect fit for Interactive Kiosks & learning spaces This state-of-the-art innovation offers a FULL-HD resolution (1,920 x 1,080 pixels) with capacitive technology enabling feather-light touch for precise and responsive functionality. Sharp Business Solutions MEA is a division of Sharp Middle East and Africa FZE that specializes in delivering innovative display solutions. The constant aim of Sharp is to provide professional displays and software solutions that increase collaboration and effective communication within the workplace, wherever that may be. We have analysed the needs of our chosen demographic and work tirelessly to provide them with practical and innovative technologies at the very cutting-edge of science. Dubai, United Arab Emirates – September 2017 – Sharp Middle East & Africa (MEA) launched its new PN-Q Series Professional Display and the stunning capacitive touch screen, PN-40TC1. 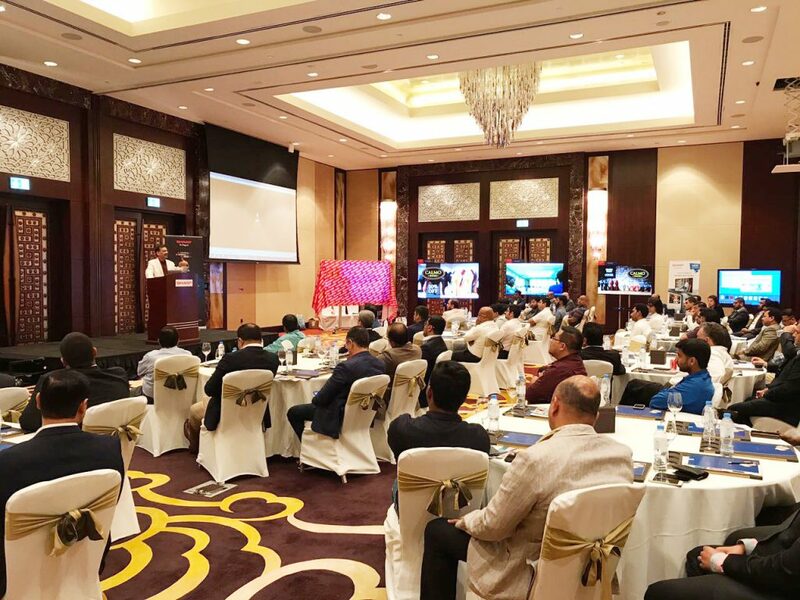 The product launch event highlighted the value and applications of the two new product lineup which was held at Conrad, Dubai, UAE. Event attendees had a chance to experience PN-40TC1’s capabilities. Sharp MEA also showcased its flagship professional display and the world’s largest UHD Professional Display, PN-H120 during the launch. The attendees were mesmerized with the size, content quality and brightness of the PN-H120. This flagship model delivers an incredible 3840×2160 resolution (4K) with the max brightness of 750 cd/m and designed to operate 24/7. World’s Largest UltraHD Professional Display, Sharp PN-H120. The new Sharp PN-Q Series are available in 90-inch, 80-inch, 70-inch & 60-inch screen options. This new series can withstand 16/7 operation while offering FHD content quality. PN-Q Series will fit various applications in retail, hospitality, banking and other businesses that requires digital signage. Dubai, United Arab Emirates – March 19, 2017 – Sharp Middle East and Africa FZE (MEA), a subsidiary of Sharp Corporation Japan, has introduced a new 40-inch Capacitive Touch-Screen LCD Monitor, the PN-40TC1. This technology houses a full-flat design with 10-point multi-touch functionality, ideal for meetings among groups of two to six people that are held in limited spaces, the so-called “huddle spaces”. State-of-the-art innovation offers a FULL-HD resolution (1,920 x 1,080 pixels) with capacitive technology enabling feather-light touch for precise and responsive functionality. The high sensitive touch technology facilitates ease of communication throughout meetings. To enhance the accuracy of on-screen writing the PN-40TC1 comes with an extremely fine 2mm-tip Touch Pen. The monitor has a variety of orientations including landscape, portrait and face-up, allowing scope for a number of applications. It is also equipped with an expansion slot with the Intel Mini Open Pluggable specification. The PN-40TC1 comes with a fleet of innovative software including the SHARP-Pen-Software for annotation, the Sharp Touch Viewing Software for Multi-File Viewing and the Sharp Display Connect for multifaceted wireless communications making this monitor the ultimate visual companion. “With the launch of the New Capacitive Touch Screen in the 40-inch class, the PN-40TC1 will address diverse requirements within the Display Market. It will change the dynamics of Visual Displays within Retail, Hospitality & Corporate Environments. The PN-40TC1. has the ability to significantly improve your operations, whatever your business may be,” said Ravinder Kumar, General Manager, Business Solutions Division, Sharp Middle East and Africa. For more information about Sharp PN-40TC1, visit http://www.sharpdisplaysolutions.com/product/pn-40tc1. Sharp MEA showcased its Education Solutions during the first Digital Innovation Summit organized by JESS (Jumeirah English Speaking School) on 15th and 16th October 2016. The event had aimed to bring together teachers and school leaders to share the best practices in both teaching, learning and in digital strategy. Showcased at the event were the 1×2 80″ Capacitive Intelligent Touch Board and 2×2 55″ Video Wall. Education Solutions provided by Sharp attracted a lot of interest. Over 300 educators attended the event. Sharp was proud to welcome the students of Birla Institute of Technology (BIT), RAK at the Sharp experience centre on the 25th and 26th May 2016. BIT, RAK is an Indian university that is a branch of the main campus is India – Birla Institute of Technology (BIT), Ranchi. BIT, Ranchi has consistently been rated among the top ranking institutions of technical education in India. Making this 60 year old institution the most premier engineering destinations in India. BIT, RAK offers programs in Engineering & Technology, Architecture and Business Management at the Undergraduate and Postgraduate level. Sharp Business Solution Team worked in collaboration with the Consumer and New Business Development divisions to present the students with various products and technologies that add value to everyday life. The visit was split into two groups for both the days. The sessions included, an understanding of the Plasmacluster technology, 8K technology demo, Intelligent Touch Board demo, introduction of the MFP’s and the unique Sharp technologies for the future. Also during the session, the students tweeted about the experience on #SharpEduSol. It is dedicated twitter page for Intelligent Touch Board technology dedicated to Education. The total of 50 students found the sessions to be interesting and had a deeper understanding of Sharp’s various technologies.